Another NHL offseason, another blockbuster trade from Montreal Canadiens GM Marc Bergevin. On June 15, almost one year to the day since the infamous PK Subban trade, the Canadiens sent ultra-promising defensive prospect Mikhail Sergachev and a conditional second-round pick to the Tampa Bay Lightning in exchange for dynamic forward Jonathan Drouin. Bergevin on the Hot Seat? At first glance, this trade seems like a desperate move to inject some offense into the lineup and perhaps prove to both fans and franchise netminder Carey Price that the team is serious about winning now. It is common knowledge around the hockey community that Bergevin may not be the most comfortable GM in the NHL, so a lot of pundits are questioning whether this trade was actually made to improve the club or if it was a last ditch effort to save his job. Bergevin should avoid the guillotine with this move, especially after signing Drouin to a team-friendly, six-year, $33-million extension for an annual cap hit of $5.5 million. Many seem to think that they overpaid for a player who has only had one pretty good season to date, but looking at some similar contracts, this deal should be seen as a steal sooner rather than later. After the ludicrous six-year, $3.9-million-per-year contract given to Andrew Shaw upon his acquisition at the draft last year, Habs fans should breathe a sigh of relief on this one. As with Subban, Bergevin stated publicly that he would not trade Mikhail Sergachev since he was arguably the best player Montreal has drafted in the last 10 years when they selected Max Pacioretty, Ryan McDonagh and Subban himself (what a haul!) in the 2007 draft. Initially, this writer threw his hands in the air upon learning of the trade, but Jonathan Drouin, who was the third overall pick in the 2013 draft, is only 22 years old and is still three to four years from entering his prime. After breaking out in the 2014-15 playoffs, Drouin’s 21 goals and 53 points this past season would have put him third in each category amongst Canadiens skaters. It’s no secret that a lack of scoring was a major contributor to the Habs’ first-round elimination to the New York Rangers, and if rumors of Alex Galchenyuk being traded and Alexander Radulov walking in free agency are true, then Montreal is going to need Drouin to be the real deal. 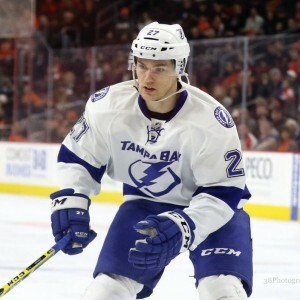 The big question seems to be whether Drouin is the type of player who is going to make his linemates better or if he depends on being surrounded by talent in order to be successful, but that question seems to be answered after taking a look at last season’s linemates with the Lightning. We can see from this chart that Drouin spent most of his time at even strength with Brian Boyle and Valtteri Filppula, who are not exactly top offensive players. Although he did spend the majority of his power-play time with Nikita Kucherov, it’s encouraging to see that he was still able to notch over 50 points primarily with 3rd line players. He’s all but guaranteed top six minutes in Montreal and should slot into a line with Alex Galchenyuk and Brendan Gallagher, assuming Claude Julien keeps last year’s top line of Max Pacioretty, Philip Danault and Radulov intact. Of course, all of this is contingent on the Canadiens re-signing Radulov and retaining the services of Galchenyuk, but if Drouin sticks within Montreal’s top-six all season, he should not only increase his own offensive output but also help Galchenyuk and Gallagher bounce back from disappointing seasons. Most Habs fans were hoping for Bergevin to acquire a top-line center, and while Drouin played on the wing throughout his tenure in Tampa, he’s perfectly capable of playing center and should absolutely get a good look there at some point. If he can win more than 50 percent of his faceoffs and handle the defensive aspect of his game, then it would make sense to re-sign Galchenyuk and keep him on the wing. Drouin only won 43.6 percent of his draws this season, but many young centers struggle in the dot initially, so there’s not much to be worried about there. This would then give the Canadiens a really good looking top six of Pacioretty-Danault-Radulov and Galchenyuk-Drouin-Gallagher. Arturri Lehkonen, Andrew Shaw, and Paul Byron are all capable of pitching in 20-25 goals and Charles Hudon should get every opportunity to make the team, so secondary scoring from the bottom six is also a strong possibility. Montreal will struggle to get offense from their defense barring any more moves, but this forward group looks promising on paper. It seems safe to say that bringing in Drouin provides a serious boost to Montreal’s anemic offense and a player that has proven to step up when it matters. He had five goals and 14 points in 17 playoff games in 2015-16, which put him in a tie with Victor Hedman for third in team scoring. Offense was Montreal’s Achille’s heel in this year’s early playoff exit, so they’ll be counting on Drouin to elevate his game come April. It is hard to argue that there was, or still is a better player than Drouin available via trade or otherwise, and getting a 22-year-old future superstar for a player who has only played four NHL games should be seen as a big win. Even if Sergachev turns out to be the real deal in Tampa, this was a trade that Bergevin absolutely had to make, and as difficult as it may be to watch Sergachev succeed in Tampa, it will be equally fun to watch Drouin do his thing in Montreal.